No it’s not a typo, I did mean Movember. Movember is an annual event that takes place during the month of November. Men are encouraged to grow moustaches/beards and not shave for the month (no matter how it looks) in order to raise awareness (and funding) of men’s health issues such as testicular cancer, prostate cancer and mental heath problems. I have decided to share a crochet beard pattern I first designed several months ago. It came about as my husband needed to wear a beard to his friends stag do (but didn’t want to spend months growing it) – this is him posing! Others face painted theirs on or made them from material. He was good enough to agree to his photo being included in the crochet beard pattern which is available as a pdf. 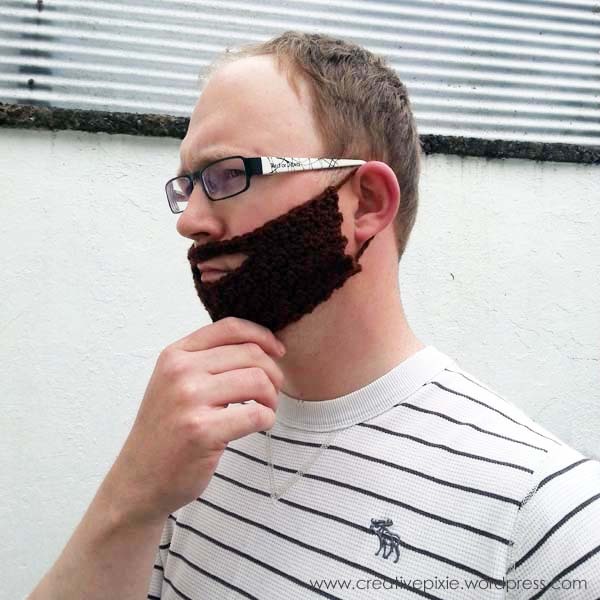 So now anyone who can’t grow a beard or wants a quick beard for a costume can crochet one up quickly. My girls thought the beard was hilarious so I made another one so that they both had one to play with. So there you go, happy Movember! Thank you for getting in touch. I’m so pleased to hear that the pattern will be of use to someone and for such a worthwhile cause too. Great post, important theme. I have stubble all year round, but am thinking I may ‘sculpt’ it this month. My husband is going for the ‘handle bar’ moustache – it’s early days and looks naff -ha! Ha! Jean, you truly are the creative pixie!! Fantastic design, and the girls look so cute playing with theirs. The Santa beard sounds wonderful. Thanks Marianne. Maybe I could crochet mini beards for my kittens – now that would be funny! So fun! I love them! Yeah, my girls love any excuse to dress up. During the summer Miss P loved getting on a high-vis jacket and hardhat to ‘work’ in the garden – she’s a strange pickle! Great pattern. Well done you. Love the photos of it on your girls. Thanks-they had fun playing with them.